Here we have The Dangerous Alphabet, a twisted picture book offering from Neil Gaiman (illustrated by Gris Grimly). 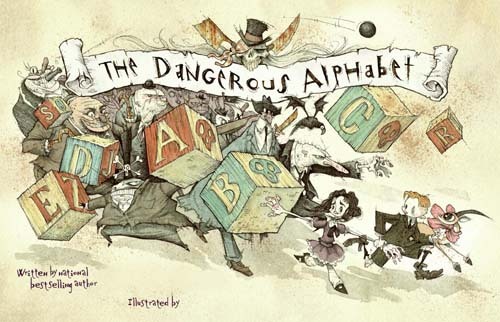 It’s an interesting alphabet book with an actual story. Two kids set off on an underground adventure in what looks like a bathtub. Along the way they meet scary things, hideous creatures, a seedy underworld that they must navigate. They are dressed like Gothic English schoolchildren, so no doubt this adventure is more sinister (and filthy) then they are used to. But they make it through to the other side, and along the way is a clever and dark book for kids. It doesn’t feel cloying or contrived like a lot of alphabet books. A great Halloween offering for younger kids or something to introduce older elementary kids to Neil Gaiman.